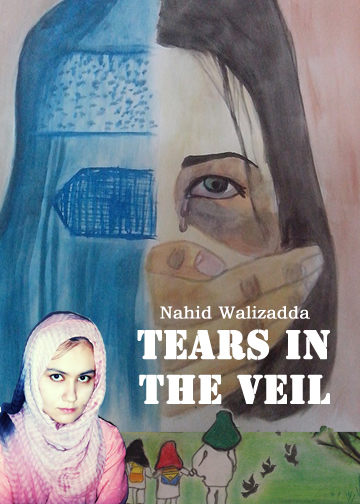 A poet, an artist and a writer, Nahid Walizadda is using art advocacy in a powerful way to tell her story, and to share the true picture of the reality that challenges many women in her community. I have three sisters and one brother. My mother is a housewife and my father is a doctor. He first worked in an American organization called ATC as a surgeon. He helped people who had lost their legs and hands in mines. After finishing with that organization, my father started working as a doctor in one of the provinces of Afghanistan, called Badakhshan. Later, we moved to Baghlan, where I was born. I was born in 1993. I was just a month old when my family fled our home in Baghlan province. The country had been staggered by years of war then, and has sinced faced ongoing civil conflicts since. My parents, my two older sisters and I took on a 300-mile drive to seek refuge in the city of Peshawar, Pakistan. I studied in the Rabia Balkhi High school in Peshawar. My school was like a home to me. We had male and female teachers. In the mornings, classes were conducted for girls and in the evening for the boys. All the students and teachers were Afghan. After I graduated from school, I secured admission in the Bachelor of Business Administration course at Preston University Peshawar. At the age of six, I was struck by a speeding car on my way to school. I fell into a coma for three days and was hospitalized for two months. I discovered a passion for art when I was recovering. While still recuperating at home, I began to draw sketches on the lined pages of my notebook. Back when I was in school, my sketches impressed my teachers as much as my test scores. My interest for poetry started when one day, I saw, on my way to university, many women begging and children working, instead of getting an education. From the window of the van that I was in, I saw homes made of fabric and sticks and women washing clothes and children swimming in dirty water. Though I love rainy weather, I do become sad when I think of what these women will do when it rains. Being a woman in Afghanistan and Pakistan is really hard and seeing that makes me sad. It hurts to watch on television or read in the news about stories about women being burnt or killed by their husbands. How many women remain illiterate because of Taliban! I wonder why we women are silent. Why must men claim to own us? That was when I started writing poems about women and I sent one poem and some of my drawings to Afghan Women’s Writing Project (AWWP). The readers loved my poem. My poetry and drawings were also published online, via Google and in a magazine called OF NOTE. I want to complete my education completely. It’s one of my dreams to pursue a Master’s Degree in Business Administration in the United States of America. My ultimate goal is to return to the land of my birth in order to address issues concerning women’s rights. My dream is to see all people happy, and to see the world as a peaceful and safe place. My ambition is to became a leader to address issues that challenge women and give them equal rights.